Now you have my Italian friends to thank for this one. My very gorgeous and very good friend Lara first put me onto this recipe and it was amazing. I’m not sure I cook it quite as well as her. 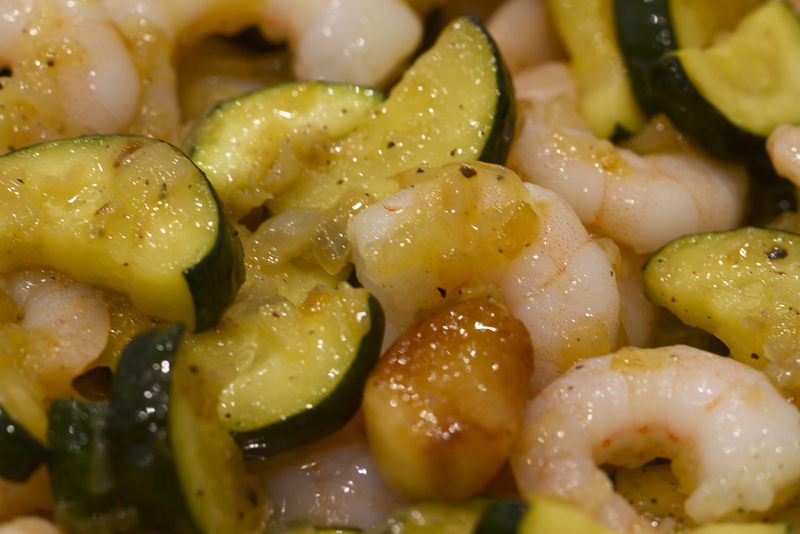 (She’ll say she cooks it better 😉 Plus I’m sure she’d say I should call it Prawn and Zucchini! I then had one of my Italian flat mates Jessica cook it for me, again absolutely amazing. So I decided to start to cook it myself it and figure out my way of cooking it. I think I’ve got a pretty good version of it. Ok so I’d bought my Dad a very nice bottle of South African Sauvingon Blanc for fathers day that we had with the meal and it went really well. Really crisp and fresh…that’s about the current repertoire of my wine knowledge. 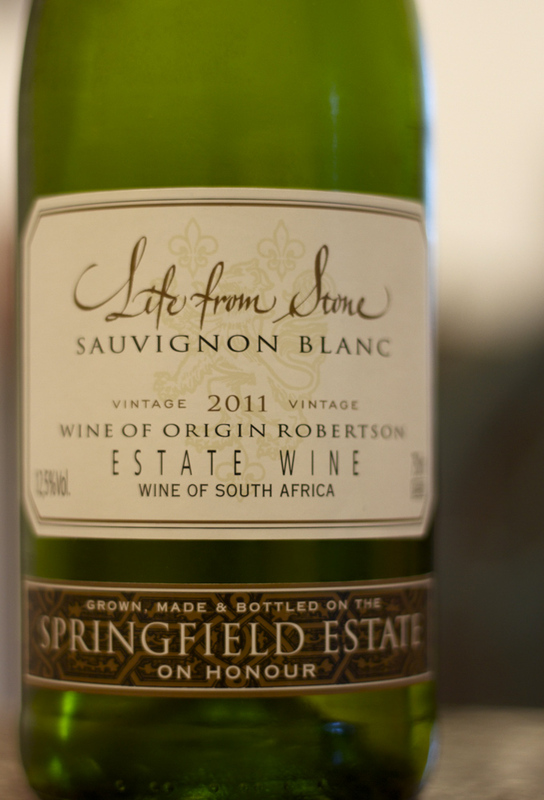 It was a 2011 Sauvignon Blanc called ‘Lite from the Stone’ from the Springfield Estate. Well worth trying. It’s up there with the best NZ Sav Blanc’s. With the pasta we had a nice little cherry tomato salad with a very simple baby gem lettuce salad dressed with the liquid from the tomatoes. King Prawns Fresh uncooked for preference but if you can’t get them then use the cooked prawns. King prawns would be better but if you’re on a budget or can’t get them then use those little shrimp you can get. They’re pretty reasonable. If you are lucky enough to live somewhere with great seafood or use a good fish monger then for sure use fresh prawns. Dry pasta the kind of pasta is up to you. Fusilli works well. 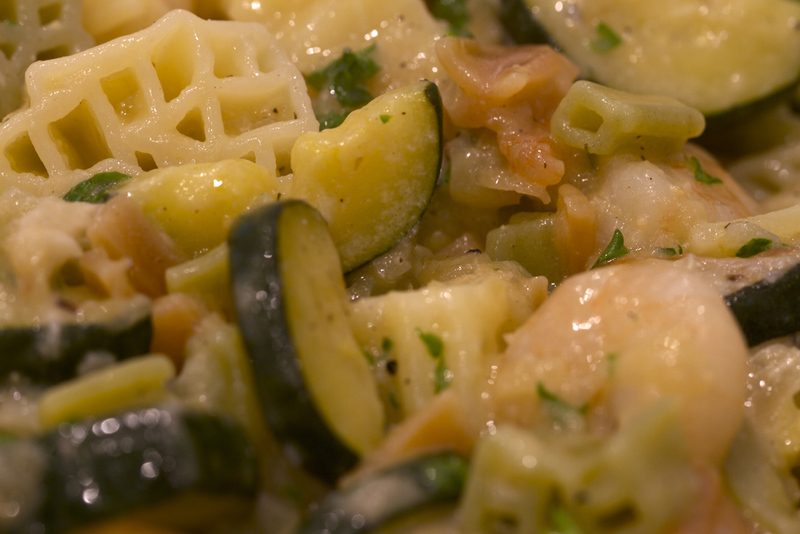 For this one I used some pasta I was given as a present from Italy by my friends parents. It was pasta in the shape of the villa they were staying in! La Trullesa. The actual pasta was called Trulletti Tricolore I think. All in Italian so I could be wrong. Anyway it was really nice. 1. ok so get a large deep sauce pan and fill it with water and turn it on high. Now in a large frying pan put on a medium heat and add a good few lugs of olive oil. You want enough to cover the entire base of the pan. 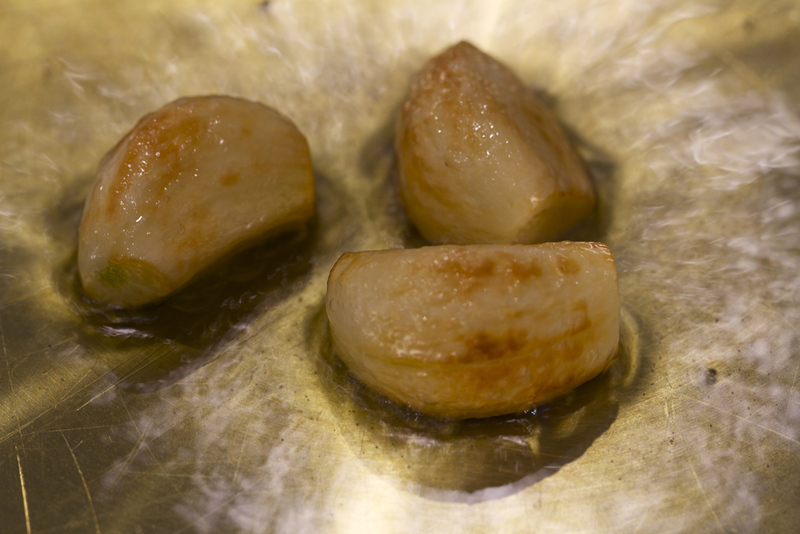 Now add the cloves of garlic and let them lightly brown. Make sure to keep turning them over. This will take about 2-3 mins. 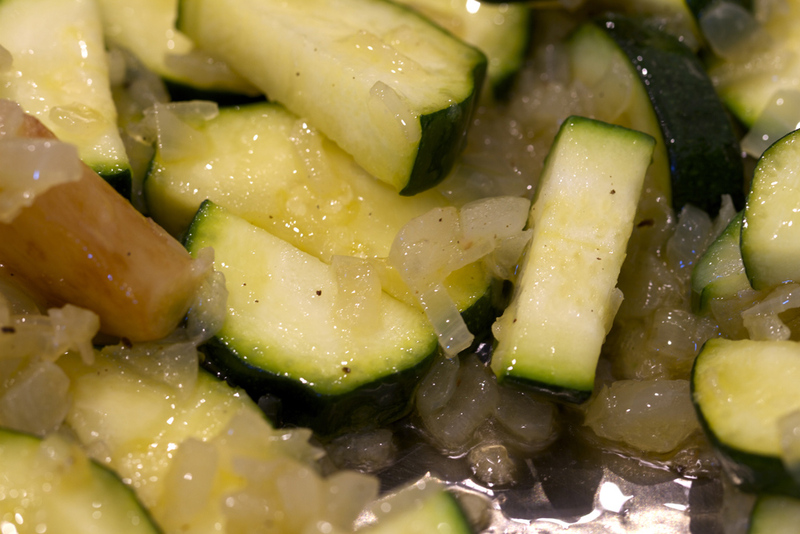 Once they have taken on a bit of colour add the onions, season with a pinch of salt and pepper and begin to cook down. This stage is so important to get the sweetness to the dish so take your time with this bit. We want the onions to cook nice and slowly. This will take about 10 mins. Keep moving it around and they will very slowly take on a bit of colour. 2. 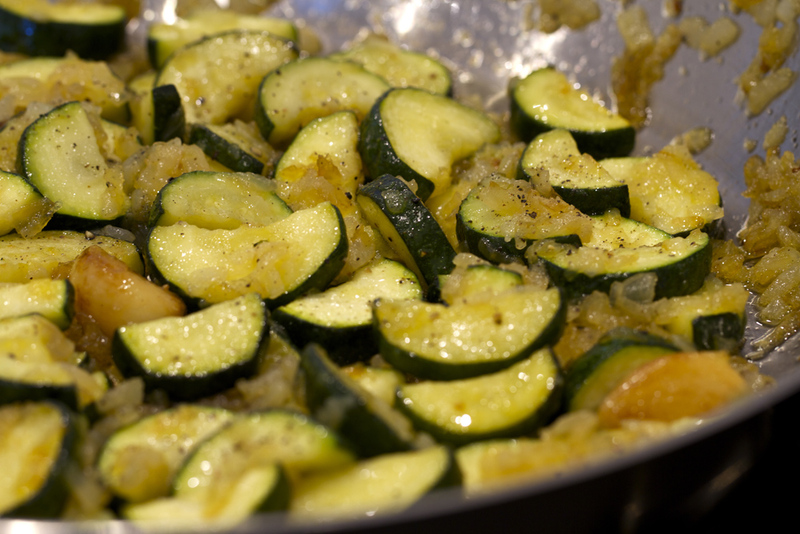 One you reach this stage add the courgettes and turn up the heat very slightly. Season with another pinch of salt and pepper. Move these around every minuet or so. Do this very carefully as we don’t want the courgettes to break apart. Again we are going to cook these quite slowly as they pick up the sweetness from the onion as they soften. After about 5 mins add a knob or two of butter. Now cook this for a further 5 mins. The courgettes will soften and start to take a bit of colour. 5. Ok so now we are going to add a splash of milk to the pan (about 2 shots worth – 60ml) and give it a little jostle around and give it 1 min. Turn the heat down to low at this point and add a bit of Parmesan and a pinch or two of pepper. 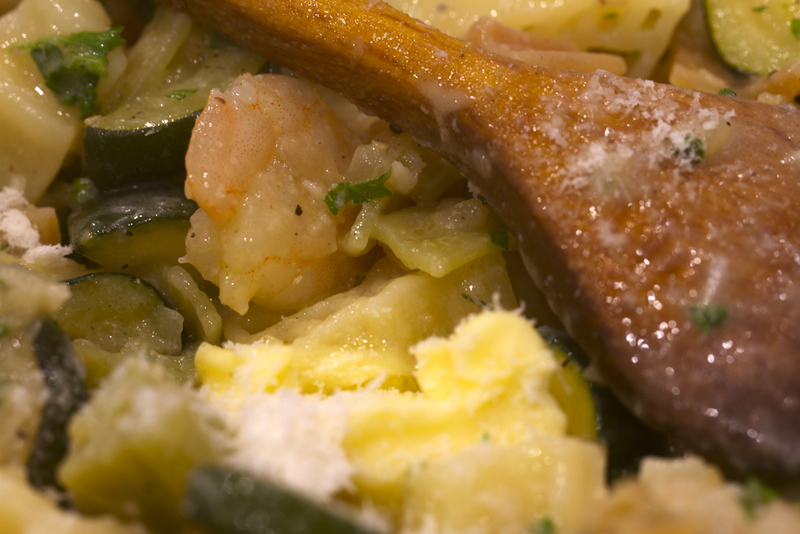 Get a ladle or a big spoon and get some water from the pasta and put a tiny bit (one tablespoon) into the pan and mix. 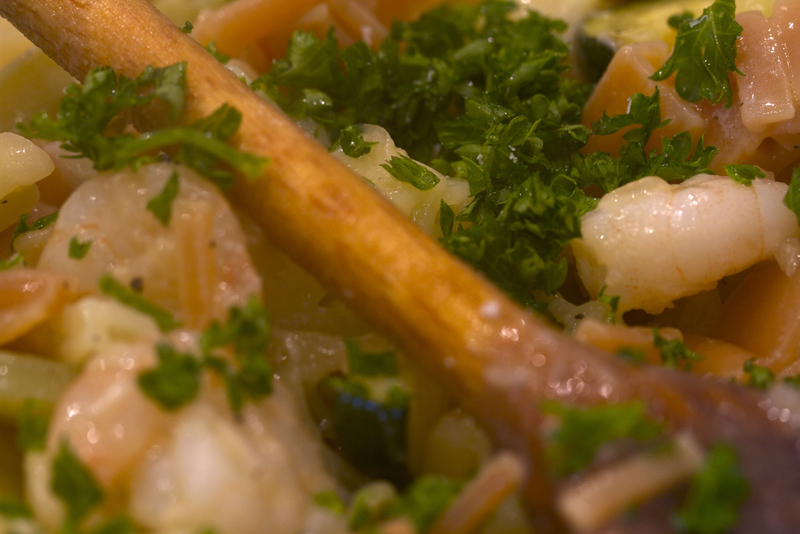 Now find the 3 cloves of garlic and mash with a fork and stir well into the sauce. 6. Now the pasta should be done so put some of the pasta water in to a cup or bowl and then drain the pasta. 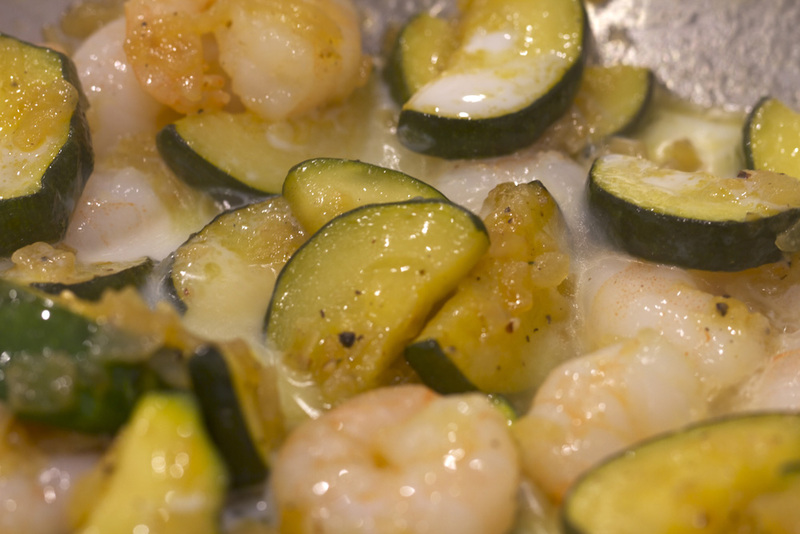 Put back into the pan and drizzle a tiny bit of olive oil and salt and pepper and stir. 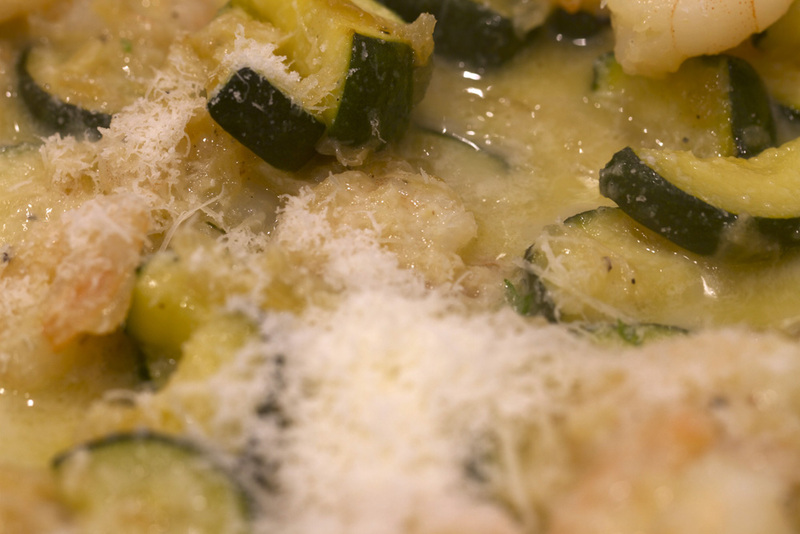 Now add another handful of Parmesan and some of the fresh parsley to the prawn and courgettes, mix well then add the pasta and half a ladle of the reserved pasta water. Mix well. If you’re good as tossing then give it a good toss to get it well mixed. 7. You don’t want too much liquid. Just enough to coat everything. If it seems a bit dry then add some more of the pasta water. Taste and add more pepper. If it needs more salt then add a bit more parmesan. At this stage add the remaining parsley and a knob or two of butter and give a final toss. Again if it’s gone to thick then add a touch more pasta water. There we go that’s pretty much it. 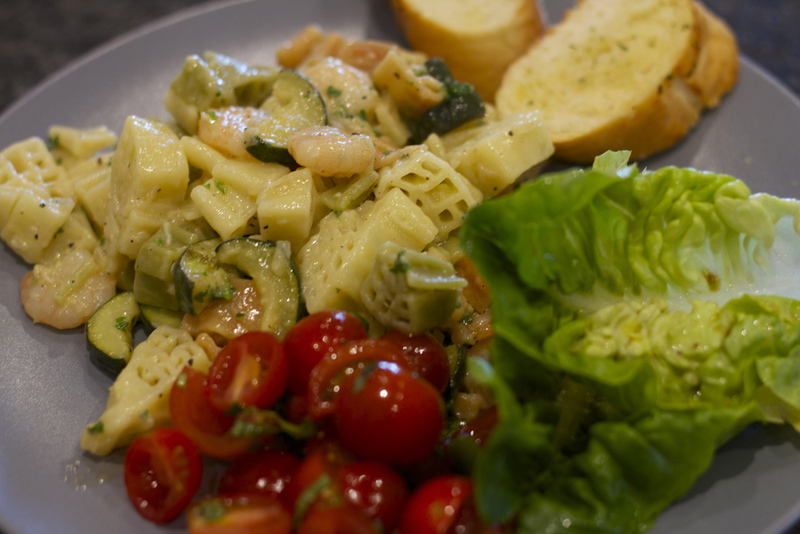 Serve with a salad and some garlic bread.